On November 14th 2008, the Cartoon Network returned the Caped Crusader to television in a series well behind its time, and thankfully so. In Batman: The Brave and the Bold, the Dark Knight is back to the Batman of an era long since past. He has a personality, a sense of humor, works well with others, and yet still manages to be the mysterious Batman. 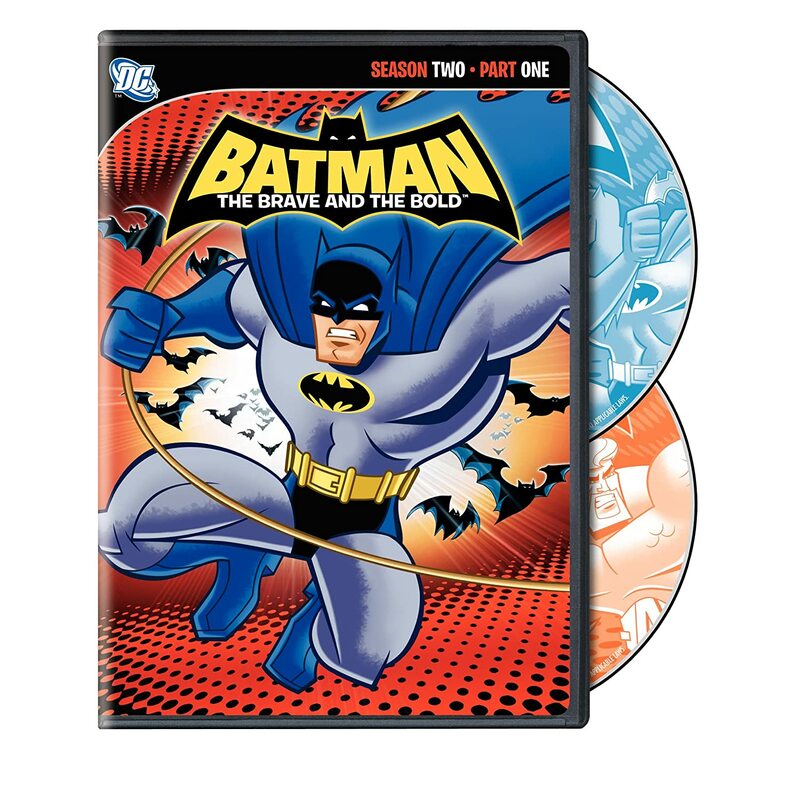 Based on the DC comic book The Brave and the Bold, in which Batman is partnered with other superheroes, Warner Home Video has finally brought the second group of thirteen of the twenty-six episode first season of Batman: The Brave and the Bold to DVD on March 15th, 2011. The delay in getting the entire first season out on DVD is almost as frustrating as splitting the season into two sets. The chemistry within the partnerships found in this new television venture is reminiscent of the Super Friends cartoons of the '70s. The significant difference being that we get to see some lesser known stars of the DC universe work with the winged avenger. In the animated series of the '70s, Batman was primarily teamed with Superman, Wonder Woman, and Aquaman. Though we do see Aquaman in this series, the characterization is much different than that of the Super Friends, and is one part of the new series that does not work. In the first thirteen episodes of the first season we see Batman work with some familiar friends in episodes that are enjoyable though thinly written. Unfortunately it gets worse in the second half of the season as the partners become more obscure and the writers seem to be playing a game of “Top This” with stories that get increasingly ridiculous. Ultimately the series is about relationships, and the interaction between the Caped Crusader and his episodic colleagues is the most enjoyable aspect of these efforts. The best example comes in episode eighteen, “The Color of Revenge,” in which Batman is reunited with the now grown and independent Robin. The dynamic is enjoyable though, like many of the episodes, somewhat lost amidst a contrived story featuring weak antagonists. In this case, our Brave and Bold buddies take on “Crazy Quilt.” Not the weakest bed the writers have made, but far too messy for us to have to lie upon. The formulas for the stories remain the same as the focus is more on the battles themselves than the stories, and the writers seem to feel that if the environments are changed drastically, the audience won’t mind. A bat on another planet, in another dimension, or time still bites. From working with Red Tornado to discipline his renegade son in an episode that would make Data proud to dealing with Bat-Mite and heroes from the future and past, it all gets topped by the musical extravaganza that is episode twenty-four “Mayhem of the Music Meister”. Yes, the majority of the episode is done in song, and the plot is as weak as the lyrics and continuity is thrown out the window for the sake of the rhyme. “Hey, let’s animate Cop Rock” could be heard through the creative halls that day. Along with the focus on relationships, Batman: The Brave and The Bold does manage to excel in animation and vocal talent. The animation has a sharp look to it that allows the characters to jump off the screen. Diedrich Bader voices the Batman and truly captures the character like we have not seen in years. Neil Patrick Harris does an excellent job with what he is given as the afore mentioned Music Meister, as do many of the vocal artists. There is no bonus material on the new release, and splitting a season into two releases is generally frowned upon by the public. Recommendation: it’s fun to look at for a while, but gets tiring fast. The first half of the first season is superior, though simply because the stories are a bit less ridiculous. The writers need to get back to partners we know and love, and focus more on the stories and less on the environment. Welcome to TVGA Hombre ! Great to get your take on this release along with Greg's. Love your "let's animate Cop Rock" line, hilarious !